Books about brothers are rare, so it's quite pleasing that this one is absolutely lovely. Spencer and Vincent are two jelly fish, who love each other, play, and sing together. When they're separated by a storm and a wave of superior magnitude, it seems as though the whole ocean rallies to help them. With some interesting back matter, this is a fun read-aloud, and a story of persistence and brotherly love. Emily Dove is an illustrator and author who lives in Cleveland, Ohio, where the winding rivers and fall foliage never cease to inspire her. As a certified naturalist, she uses illustration as a tool to educate and inspire others about the natural world. About her debut picture book Wendell the Narwhal, Kirkus Reviews said “children will find a lot to like in little Wendell.” She also illustrated Spencer and Vincent, the Jellyfish Brothers by Tony Johnston. 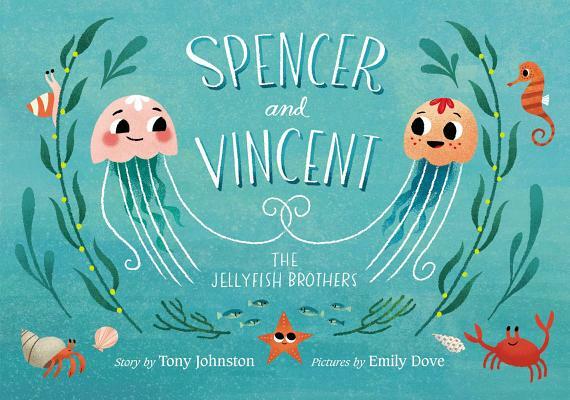 "Brothers Spencer and Vincent live happily in the sea together (“Spencer was a jellyfish. Vincent was also”), singing their favorite brotherly song, until one day a “wave of superior magnitude” sweeps Vincent away. Since jellyfish have very little power of propulsion, Spencer can’t catch up to him, so he’s helped by his friend Horace the whale and guided by other denizens of the sea until he finds Vincent and, with Horace’s help, saves him from stranding on the sandy beach. The text is deliberately silly, the brotherly song a wonderful opportunity for performance absurdity, and the humor self-knowingly arch; while the self-conscious tone threatens to overcome the story at times, the jellyfish-real details, such as Spencer’s limited movement, weirdly and satisfyingly ground the story. Dove’s digital and watercolor illustrations, usually full bleeds of the ocean and its prettied-up inhabitants, lean toward graphic art in their focus on cuteness, and they give the sea world a pleasing rhythm of filtered light and fronds of plants and make freckled, redheaded Vincent sympathetic in his plight. Older kids and younger ones will enjoy this at different levels, so it’s easily shareable with sibs of different ages, and they’ll be delighted to join in on the goofy brotherly song."